If you have any problems reading PDF files then try downloading the latest version of Adobe Acrobat Reader. There will be ride days & working bees this weekend the 27th & 28th from 10am till 4pm. Bring gloves , gardening tools, brush cutters, ride on etc. More info on our Facebook page. We will be meeting the 1st & 3rd Thursday of the month up till Winter then 1st Thursday only for Winter. Updates after that. Welcoming new & old members for 2019. Clubrooms Ballarat Airport Hut 25. Doors open about 7:30 for an 8:15 meeting. Hi all, how does a ride or drive on or in your pride and joy to raise money for a very good cause sound. ?? Poker run and Show Us Your Toys Day. All the details are on the flyer and feel free to contact me for more info. Thanks folks. Look forward to seeing all the cool stuff. !! Leaving from 609 Post Office Rd, Ross Creek at 11am. Ride will be approx 200kms plus stopping for lunch at a country pub returning to start point around 3pm for a bbq and few beers . If you can't make the ride you're welcome to come afterwards to bbq. Any queries call DT 0417 059033. As most of you would know life member Paul "Locky" O'Laughlin passed away suddenly a few months back. He was a great family man, great clubman, just a great bloke. Obviously his sudden passing was a horrendous shock to his family, as it was to all of us, but the club, family & friends have rallied round the O'Laughlins as you do in rough times. A highly successful "Backyard Blitz" was performed on Mary-Anne's back yard which bought some joy to his family. Now it is time to help out in another way. Last year Locky was keen to get an annual "Show us your toys" Poker Run up & running. The idea being bring along your bike, hot rod, muscle car, whatever. Then incorporate a ride/drive & a Poker Run. The club thought we would go ahead with it in honour of Locky. So we have named it the Locky, Show Us Your Toys, Poker Run but also make this inaugural one a fundraiser for his family. The date is Sat 24th Nov. Starting at 11.30. Riders/drivers will be let go in intervals so that we dont all turn up at the 3 pub locations at the same time. First group will leave 12pm, last 2pm. 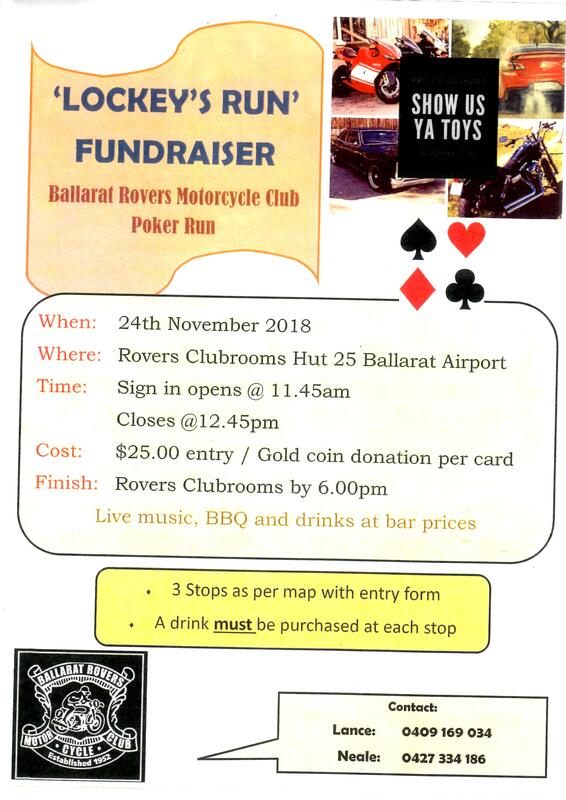 It will start & finish at the Clubrooms at the Ballarat Airport, the finish including a display of bikes & cars but is open to daily commutes, rolls canardlies, dungers, etc. Doesn't have to be for show. There will be a 6pm cut off/curfew to be back at the rooms. Distance is just over 200km & allowing for the 3 stops should take approx three & a half hours. Cost is $25 includes a BBQ tea. There will be prizes & raffles/auctions. Alcoholic drinks will have a $1 fundraiser levy placed on them but still cheaper than pub prices. All profits from the day will be going to his family. If anyone has any goods or services we can use as prizes in either the run, raffles or auctions please let the club know. Or if you would just like to donate money. Club Day next Sunday 23rd. Sign in from 9am. Club Day next Sunday. Sign in from 9am. See you all there. Please bring membership cards and licence for sign in. EFtpos available. Hi All, please note that the club day scheduled for this Sunday 29th won't be going ahead as planned, Sunday will now be a practice day for all to enjoy the Monza ruts left behind from those fast juniors on the weekend!! We do have a couple of clashes with our club days coming up, but we will reschedule as we move forward. We would like to say a massive thank you to all for the weekend, it really was a great success in very difficult times. We had so many familiar faces come out to support and represent our great club. Thank you to Polaris Australia and ASL Construction & Earthworks for their support for the event, it’s great to have these brands supporting Ballarat Rovers MCC. Well done to everyone involved, it was a tough one. It is with the sadest of hearts that I inform you that 2 club greats Alwyn "Sobes" Sobey & Paul "Lockey" O'Loughlin passed away this week. A few words on Sobes from George Langley. "I got some very sad news tonight Alwyn Sobey (Sobe) as we all no him passed away last night he was a life member President Secretary Treasurer, and a tirless worker for the Ballarat Rovers Motorcycle Club . l could write for hours & would not cover what Sobe has done for our great club RIP Sobe ." Lockey, likes Sobes, was a life member, past President, past Treasurer & had been a club stalwart. He was one of the more colourful characters of the club to say the least. He loved his club but his love for his family had no boundries. His sudden passing has shocked family, friends & club members alike. He will be sadly missed. Funeral arrangements for Lockey are yet to be finalised. Our love & best wishes go out to both families & friends in this very sad time. Full day of Viper Vintage MotoX with modern classes as well. More info Viper VMX Facebook page. Sidecars from all over Australia coming to compete over 2 days at Monza this weekend. What these guys & gals can do on these brutes of machines is nothing short of unbelievable. There will be quad racing too as a support group. Tonight is the last meeting of the year, all members & guest welcome. Come out to have a catch up before the new year. Presentation is taking a new form this year in a ride day first followed by presentation in the canteen at Monza. We’re including a ‘come and try’ day between 11am and 2pm, followed by a members ride until 5pm. Presentation will start at 5:30pm and will include a BBQ tea for $10 per family and $5 per single......all welcome to enjoy a ride, a chat, and a laugh! BYO drinks, and camping is welcome. The more, the merrier! 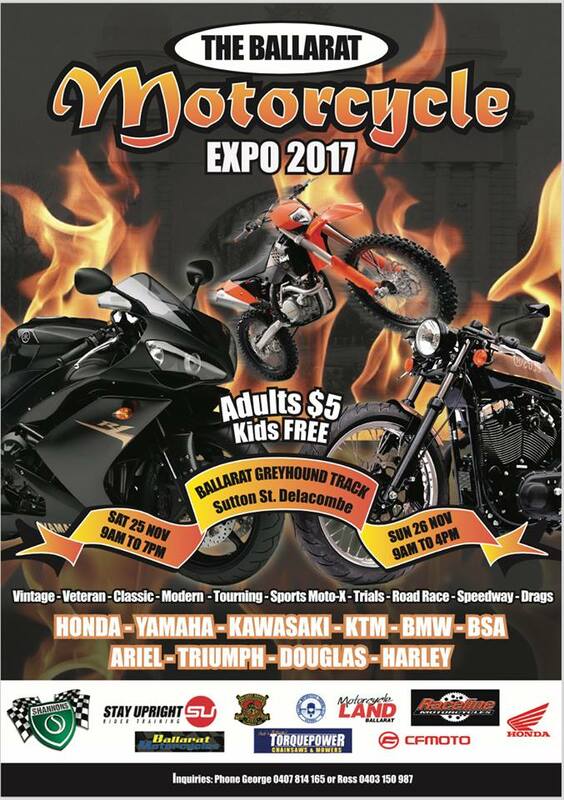 Bike Expo this Sat 25th 9am till 7pm & Sun 26th Nov 9am 4pm at the Ballarat Greyhound Track Sutton St Delacombe Vic Over 50 bike from all eras & a Mad Max patrol car. Check out flyer for more details. It is with great sadness we inform you that a legend of the club in Brian Fisher has passed away. He will be farewelled on Monday at Barnes Pleasant St. 2pm. Those riding bikes are asked to park in Darling St.
Memorial ride Sat 11th Nov. Leaving 609 Post Office Rd Ross Ck 11am so be there no later then 10:45. All past & present members, family & friends invited. No trail ride just road. Free BBQ & some refreshments afterwards. If you can't make the start it may be possible to meet the road ride en route. If the trail ride goes ahead they usually stop at the Little hards Hills pub half way. All members past & present, guests are welcome & encouraged to attend. Financial members need to have been to at least 10 meetings during the year (There are still 4 remaining) to vote at the AGM but even if you haven't been to 10 you can still participate at a general meetings & nominate for positions. No attendence criteria for Life Members. This year we are having a presentation Day/Night Saturday 9th Dec at Monza with riding etc, during the afternoon then followed by presentation in the canteen that night. More info soon. The bike Expo is on again. Sat 25th & Sun 26th. Ballarat Greyhound Track Sutton St Delacombe. Adults $5 kids free. Wyndham City Council (the “Council”) is seeking Expressions of Interest from suitably qualified and experienced service providers to operate the Lawrie Emmins Motocross Track. Council is currently reconstructing the Motocross track to comply with Motorcycling Victoria standards. A number of models for provision of access to the sport of motorcycling could be appropriate for this site. It is anticipated that the term of the agreement will be five (5) years with the possible extension of a further period of up to five (5) years. All technical enquiries relating to the works or services should be directed through the Tenderlink Forum associated with this EOI. It is free to register, any queries with registration please contact Tenderlink on 1800 233 533. Late, emailed and facsimiled EOI’s will not be accepted. The lowest or any EOI will not necessarily be accepted. 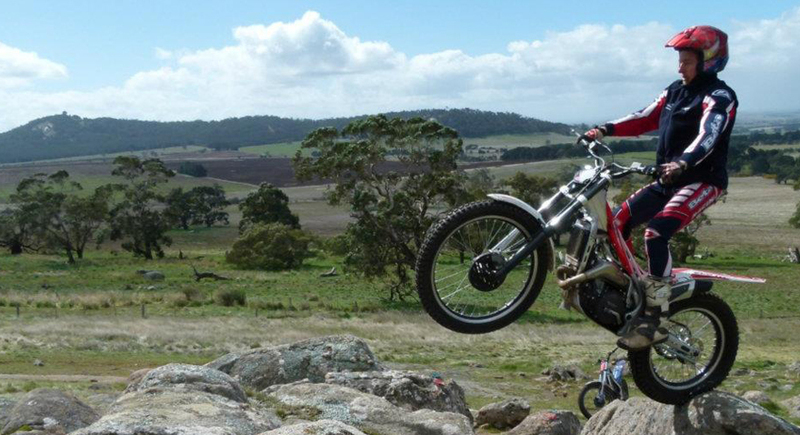 The Ballarat Rovers Motorcycle Club is hosting the Victorian Trial Championships this weekend Sat 19th & Sun 20th at Mt Bolton. 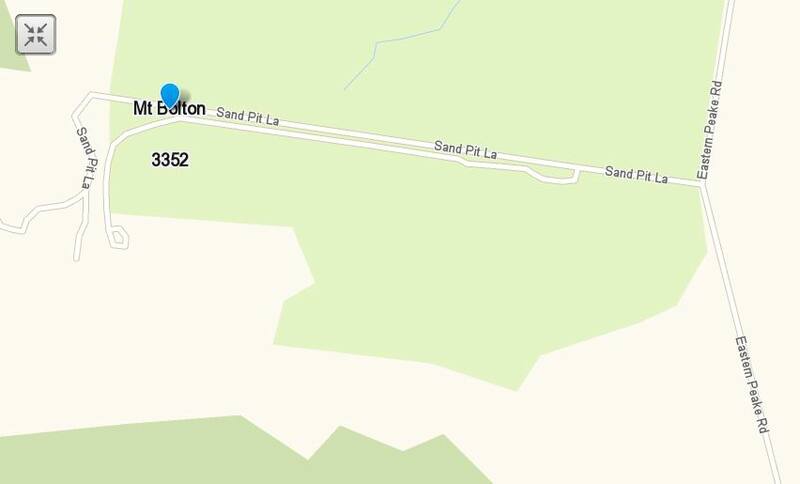 Sand Pit Rd, off Eastern Peak Rd, near Learmonth. Calling all rovers we need some helpers this weekend for the trials vic title held at fitzys place in Mt. Bolton, its an awsome day with great riding, people and you get a great veiw to. If you can help at all give fitzy or larry a message that you can help out that would be great. Fitzy 0418501068 Larry 0418503678. More info; Trials Mt Bolton. 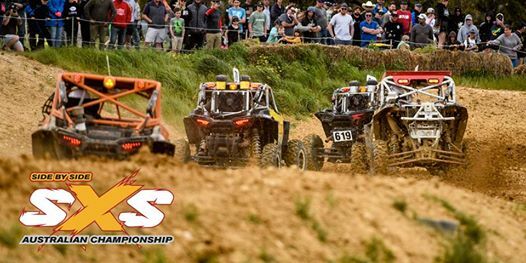 Round #4 - SXS Australian Championship - Ballarat, VIC. Monza Park Bergs Lane Mt Helen Saturday Aug 5th. Club day Sunday 2nd July. Club day Sunday 18th of June cancelled & Club room meetings 1st Thursday of the Month for Winter. Due to a clash with Western Region club day 18th June cancelled. Next one July 2nnd. Club Day Sunday 21/05/2017. For this round only there will be $5 one day memberships. We will also have Senior & Junior Quad racing, including a non comp rec class for both for those wanting to try it out at a discounted rate. Check out our Facebook page for more info. Approx 350 Senior & Junior riders will battle out the 3rd round of the Western Region MX series this Sunday the 7th of May at Monza Park, Australia's premier MX track, Bergs Lane Mt Helen. Some of Victoria's & Australia's best riders. FREE ENTRY, onsite parking, viewing points just metres the action, fully catered, plus more. Our general meetings will continue on Thursday nights, but only on the 1st and 3rd Thursdays of the month at this stage. We'd really like to have all forms of racing represented and flourishing within the club....I'm looking at you, Enduro riders! Let's get some events happening! Your input is welcomed and needed. 2016 Membership ran out on the 1st of March this year. Be mindful that if you're riding/racing you need to have a current and paid membership. Check the website for forms/costs etc. Also, we're probably overdue for a social get together. We've new faces to meet and greet! Please feel free to pop through any suggestions you might have (keep it nice, ratbags), and watch this space! First meeting for the year tonight Feb 2nd. 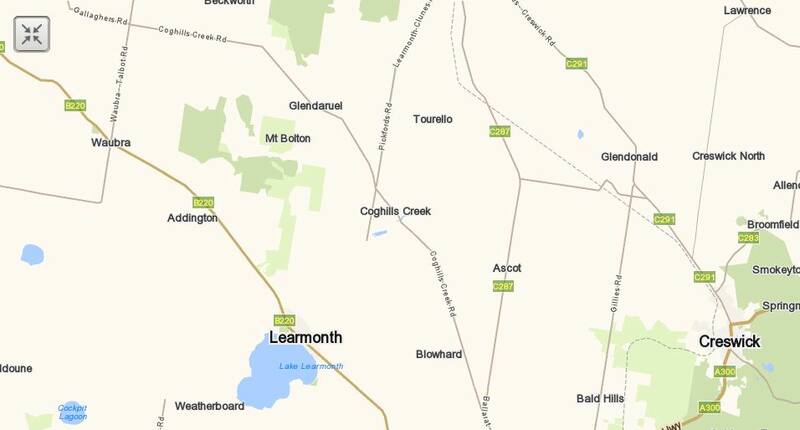 Come along for a meet & greet at trhe clubrooms Ballarat Airport from 7:30pm.